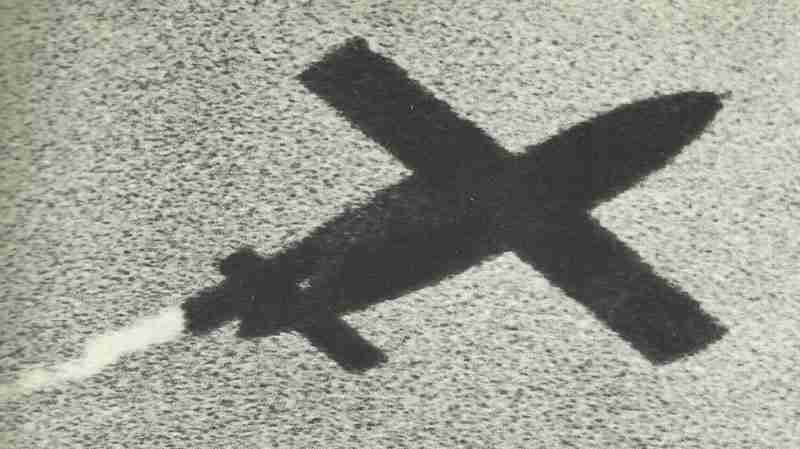 The threatening shadow of a V-1 on the flight to England over the sea. Even the exhaust fumes are visible. Allied forces capture Evreux (Normandy), Melun (southeast of Paris) and Marseilles; Americans reach Grenoble. Eisenhower vetoes Montgomery’s plan for bold drive through Low Countries into Northwest Germany. Schnorkel U-boats operate around Scottish coast until early October; only U-482 (5 sinkings) achieves any success. 211 people killed by V-1 at East Barnet (London). Britain: B-24 Liberator bomber crashes on infants’ school at Freckleton (Lancs): 57 killed. Rumania: King Michael dismisses and arrests the dictator, Antonescu, and sanctions formation of ‘peace’ government under General Sanatescu. Luftwaffe bombs Bucharest.